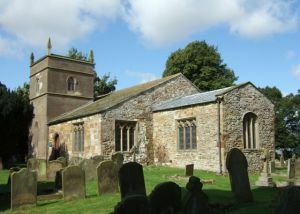 The ancient church of St Marys in North Cockerington is situated very oddly, sharing a churchyard with the parish church of Alvingham. I'm not aware of another two parish churches so closely sited. In fact, St Mary's is a mile away from the parish it was meant to serve, which might well explain why the church has been declared redundant and is now in the care of the Churches Conservation Trust. The bulk of the building dates from the 13th and 14th centuries, but there is a blocked up window in the chancel that might well belong to the Saxon period. St Mary's once served as a chapel for the Gilbertine Priory sited beside the Alvingham church. As an interesting sidenote, Alvingham church is dedicated to St Adelwold, probably the only parish church in England with this dedication. As for the priory, this was established in 1150 as a 'dual house'; that is, with both monks and nuns resident. When the priory was suppressed by Henry VIII the former chapel was given to the village of North Cockerington to serve as their parish church, because the former church there had fallen into disrepair. St Mary's is composed of a wide and low nave, very narrow chancel, and a short and very plain west tower. The nave and chancel were the original monastic chapel, and this was extended with the addition of the tower during restoration in the 19th century. The interior is equally simple, with rows of 19th-century box pews and painted scrolls of Biblical texts on whitewashed walls. Outside the churchyard is a working watermill, on a site where a mill was mentioned in the Domesday Book. That really serves to bring home just how long this quiet rural area has been settled.